Framed original, oil on board. Overall dimensions 19 1/2" x 15 1/4" (49cm x 38cm). This original painting has already been sold, but prints are still available. Please click on "Prints and More" tab. 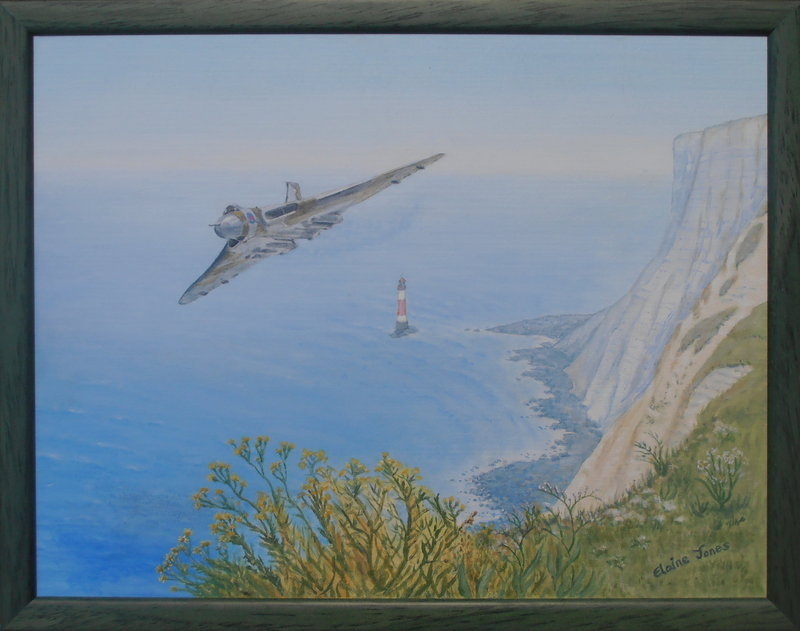 Avro Vulcan XH558, Spirit of Great Britain, passing Beachy Head on her way to the Eastbourne Air Show in August 2012. XH558 was delivered to the RAF in 1960 and was the first Vulcan B.Mk2 - and is now the oldest complete Vulcan in the world, and the last to leave RAF service, continuing from 1986 to 1993 as a display aircraft. Meticulously restored by the Vulcan to the Sky Trust after an unprecedented public fund raising effort, she returned to the sky and has awed crowds at air shows all over Britain since 2007.